Raw garlic has many health benefits. It has been proven to lower bad cholesterol (also known as low-density lipoprotein, or LDL) and blood pressure, in addition to increasing good cholesterol (also known as high-density lipoprotein, or HDL). Garlic has been shown to decrease heart attacks and strokes. 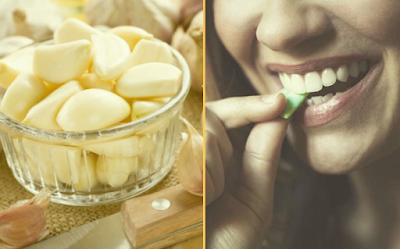 Garlic is full of anti-oxidants and can be used as an anti-bacterial. "Garlic, the Stinking Rose," an article found on olivesgarlic.com, the author writes,"During World War II, garlic was used as an antiseptic to disinfect open wounds and prevent gangrene." Garlic can be crushed. It then releases an enzyme called allicin, which kills over 20 types of bacteria. Garlic dates back to 6000 B.C. It was first used in Central Asia. Egyptians not long after that began using garlic. At this time, garlic was used in food for flavoring. It was the Indians who first realized that raw garlic had medicinal uses. It was not until the early 1900s that Americans began using garlic in their cooking. Americans looked down on garlic because it was mainly used in ethnic dishes. If you do not want to eat raw garlic alone, there are different ways to incorporate it into your meals and drinks. You can add cloves of crushed garlic to green tea. This is popular in Chinese culture. You can add garlic to any meal you choose. It will add a nice flavor and still give you the benefits it offers. Although raw garlic will give you more of those benefits. Raw garlic does not sound all that appetizing to some people. You can also get some of garlic benefit through capsules, pills and tablets. Although, these alternatives will not give you the maximum benefits that eating raw garlic can do. You can crush raw garlic and put it in meals at dinner time to cover the strong taste. When you hear that eating something is healthy, it sounds like a good idea to eat that food all the time. But that is not true with raw garlic. Eating too much raw garlic can overheat your body. That can cause yellow urine, bad breath, red eyes and even acne. So although it has many health benefits, eat it in moderation.